Ubisoft has detailed the upcoming AC Odyssey content that will be arriving in January. There’s a ton to look forward to, as it turns out. The second episode of the Legacy of the First Blade DLC, Shadow Heritage, is coming out in just a few days. Then, there’s two new Lost Tales of Greece, a Cyclops that will drop a legendary hammer, new mercenary tiers, and way more. So, first thing’s first: the second episode of the Legacy of the First Blade DLC. It’s coming out on January 15th, aka next week, as of writing this article. The name of Episode 2 is Shadow Heritage. The story picks up from where the previous episode left off. Without going into specifics to avoid spoilers, all we’re going to say is that you’ll have to defend the new life you’ve built for yourself from a brand new threat gripping the Aegean Sea. Now, that is of course nowhere close to everything that’s you’ll be sinking your teeth into this January. There’s a ton of free content coming to AC Odyssey on top of the DLC. For example, there will be two new Lost Tales of Greece; Daughters of Lalaia and Poet’s Legacy. The first one will have you training a village of women whose husbands are away in the war to fight off some kind of threat. In the second DLC, you’ll be hanging out with “Greece’s most scandalous poet,” which sounds like it could be a ton of fun. On top of that, we’ve got a new Cyclops, Arges; killing him will get you the legendary Hammer of Hephaistos. Also, there are new gear sets at the Oikos, new Mercenary tiers, a brand new high-level blacksmith, and so much more. 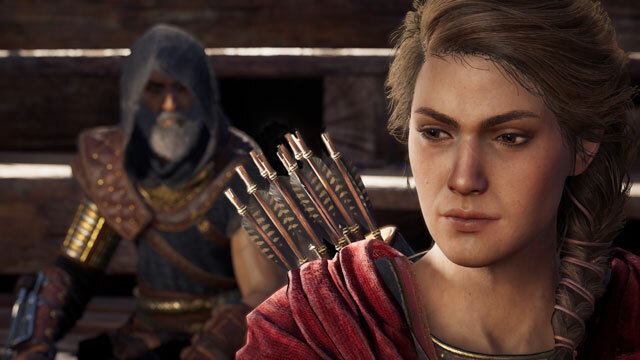 If you want more info on all the stuff that’s coming to Assassin’s Creed Odyssey this month, you can check out the video below, or head over to the announcement on the Assassin’s Creed Odyssey website.